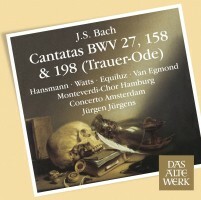 Johann Sebastian BACH: Cantatas BWV 27 (1726), 158 (1713-17) and 198 (Trauer-Ode) (1727). (Rec. 1966.) Rotraud Hansmann (sop), Helen Watts (alt), Kurt Equiluz (ten), Max van Egmond (bs), Monteverdi-Chor Hamburg, Concerto Amsterdam, Jürgen Jürgens (dir.). 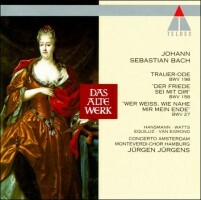 Teldec 2564 64763-2 (http://www.warnerclassics.com/). Another important reissue (out 6-25-13) involves Bach’s powerful Trauer-Ode. Listed as Cantata 198, it came outside his duties at St. Thomas – the memorial service for Christiane Eberhardine, Electress of Saxony, mounted in the Paulinerkirche of Leipzig University. Sacred and secular combine but the variety feels closer to Bach’s Passions than to the weekly cantatas (a lost Markus-Passion utilized BWV 198, to judge by the surviving libretto). Jürgen Jürgens had links to period-practice outfits (Concerto Amsterdam is on hand), but his angle is more conservative. (No overmatched boy soprano soloist or countertenor, as in Leonhardt’s entry for Teldec’s complete cycle of the cantatas.) The dated sound hits bull’s-eyes – in Leonhardt’s continuo playing, full of character, or the glowing, soft-grained support in No. 5’s alto solo. Jürgens’ chorus is larger than the norm today; No. 7’s fugal strength is impressively conveyed. The soloists make an arresting group, familiar from Harnoncourt’s pioneering 1960s efforts. Apart from Andrew Parrott’s deleted Sony (SK 60155), I haven’t fallen for the modern Trauer-Ode renditions I’ve tried. Koopman’s remake appears outside his Challenge Classics survey on CC 72286, and Pierlot’s radical downsizing is on Mirare MIR 030. I might report on them someday. Bryston BCD-1 player – Nordost Tyr interconnects – Stax SRA-12S amp (restored) – Stax SR-5N headphones.